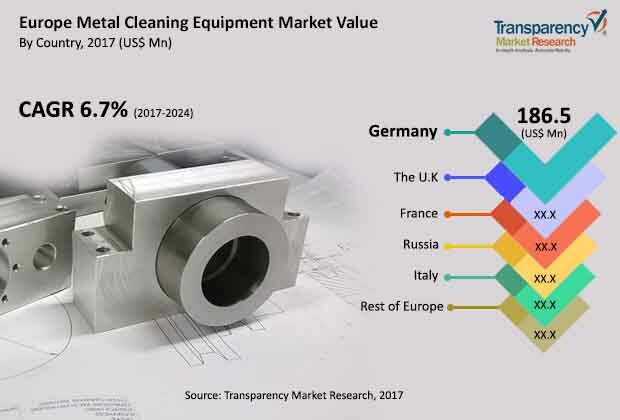 In the moderately fragmented market for metal cleaning equipment in Europe, global expansion and alliances with major vendors across major end-use industries are some of the most popular strategies adopted by the key companies operating in the market, finds Transparency Market Research (TMR) in a recent report. For instance, Durr AG, the leading company in the market presently, has expanded its network of manufacturing and consumer support sites across 28 countries worldwide. It has also entered into strategic agreements with companies such as Volkswagen. A limited number of vendors in the region provide metal cleaning equipment and services across a number of industrial verticals in the manufacturing and processing sectors. In the years to come, the market will witness a major shift from solvent-based metal cleaning solutions to aqueous-based solutions as the demand for the latter continues to rise at a significant pace among clients. For vendors operating in the Europe metal cleaning equipment market, this will be a major growth opportunity and will require companies to invest funds on the research and development of aqueous-based metal cleaning solutions, says TMR. Companies operating in the Europe metal cleaning equipment market will benefit the most from growth opportunities in the power generation and distribution sector. The European Union is expected to import nearly 20% of its overall electricity consumption volumes from MEA through transcontinental energy and power linking grids by 2020. The task will lead to an increased need for the deployment of power transmission infrastructure stretching across the Mediterranean and the desert. Processing and degreasing of metal and metal parts used in these new power distribution centers will require complex metal cleaning equipment, and will emerge as a major growth opportunity for the Europe metal cleaning equipment market. Germany is presently the leading country in the Europe metal cleaning equipment market, with a 24.3% share in the market’s overall revenues in 2017. The country has a large number of some of the world’s largest manufacturing companies in the automotive, electronics, and industrial equipment sectors. The country is also home to some of Europe’s largest metal cleaning equipment companies and is witnessing the rise of a vast number of startups in the field, called jobbing shops. These factors will contribute substantially to the future growth prospects of the Germany market for metal cleaning equipment in the next few years. Germany contributed the largest number of unit shipments to the Europe metal cleaning equipment market in 2017, accounting for a total of 8,630 units of the overall MCE shipments in the year. From 2016 to 2024 as well, Germany is expected to remain the largest supplier of metal cleaning equipment in the European market. In terms of overall growth, the market for metal cleaning equipment in Germany is expected to rise at a CAGR of 6.1%. On a whole, the Europe metal cleaning equipment market will expand at a healthy CAGR of 6.7% from the period between 2016 and 2024. At this rate, the market, which had a valuation of US$765.0 million in 2017, will rise to US$1,202.7 million by 2024.